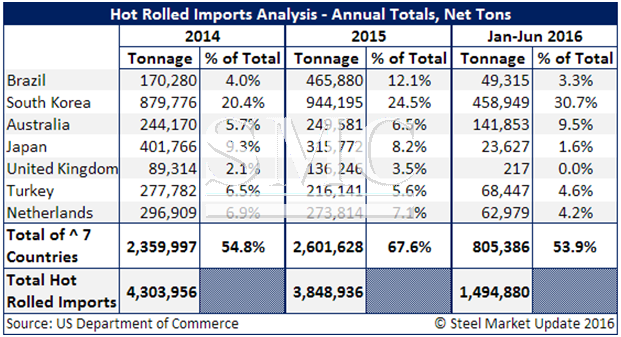 On Friday the U.S. Department of Commerce announced their final determination findings on hot rolled steel dumping margins and countervailing subsidy rates for Brazil, South Korea, Australia, Turkey, Japan, United Kingdom and the Netherlands. In the article above SMU reproduced the press release provided by the Commerce Department. In this article SMU are going to compare the preliminary determinations with the final and see if there are any surprises that could impact U.S. customers. 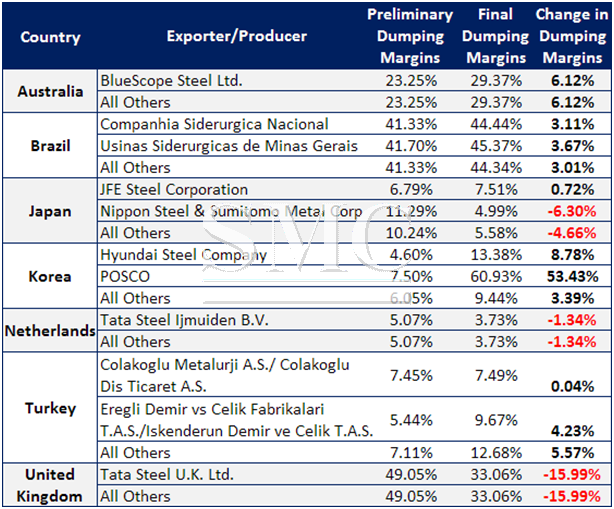 SMU shared the following data with our member companies last Tuesday but SMU thought it would be valuable for your understanding of the impact of these cases as SMU members discuss each of the countries listed below and if the adjustments made by the U.S. Department of Commerce could potentially affect hot rolled steel exports from these countries moving forward. venture partnership with US Steel. Jointly, POSCO and US Steel own a steel mill (USS/POSCO or UPI) close to San Francisco, California. trade attorney Lewis Leibowitz about the POSCO situation and he advised us that POSCO has the ability to post the cash deposits and continue to supply USS/POSCO if they choose to do so. and get the duty reduced. The expectation is that review could take until the end of 2018 to complete. Brazil also saw their final determination results rise slightly (see below) as did Australia, Korea (other than POSCO) and Turkey. The United Kingdom saw the biggest reductions at -15.99 percent but still at a very high percentage (33.06 percent). Japan and the Netherlands also saw their percentages drop (see below).